A WRAPAROUND porch curves around the front door of an old Bridgehampton, N.Y., farmhouse that Pamela Glazer, an architect based in Southhampton, renovated and enlarged last year. But that formal entrance is seldom used. Instead, just beyond the porch, Ms. Glazer designed a more utilitarian foyer — a mudroom — with a glass-paned exterior door with its own stoop where family and friends go in and out. 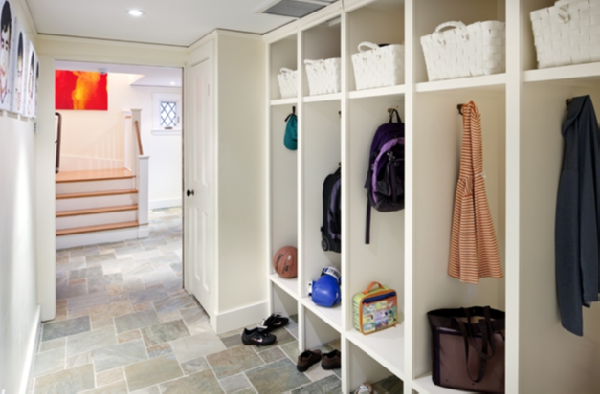 The 8-foot-by-15-foot mudroom has a colorful slate floor that doesn’t show dirt, built-in cubbies for children to stow backpacks and jackets, a bench so you can sit to take off or put on shoes as well as two powder rooms, one designated for children and the other for guests. The mudroom also provides extra storage for large serving items that do not fit in the kitchen, and a separate icemaker. As floor plans become more open, and walls between kitchens, dining and entertaining spaces vanish, home buyers on Long Islandincreasingly want a designated room or space with a shelf to drop keys, and hooks and cubbies for the outerwear, shoes, briefcases, backpacks and assorted sports gear that otherwise gets strewn through the house. As a result, architects, interior designers and builders are including enhanced mudrooms as entryways, usually off the garage or a side entrance, that function as a sort of organization center for the house. The mudroom not only reduces clutter coming in; it also makes it easier to grab keys or find gloves as you dash out the door. For older homes, builders are adding mudrooms on while interior designers steal bits of space from the garage or kitchen to create the practical space. “People invariably like to drop their stuff by the door,” Ms. Glazer said. Though the front door of a five-bedroom shingle-style home with a “modern modification” she designed for clients in Bridgehampton is very accessible, “they want to keep it neater” and not traipse in with sandy or muddy shoes or groceries. 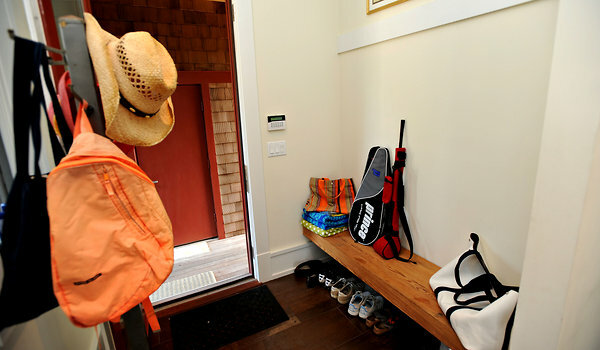 Instead, a breezeway between the two-car garage and the house opens via a side door onto a mudroom with a bench and garment hooks plus a closet where the owner, a lawyer, and his 13-year-old son, stuff a plethora of sports equipment. Judy Studin, an interior designer from Great Neck, said that mudrooms are a must-have, “even when one has to make another room adjacent to where a mudroom would be smaller” to accommodate it. At a home in Woodbury, Ms. Studin said, the garage entry to the new center hall colonial is “unfortunately adjacent to the front door.” She carved four feet off the dining room, creating a hallway and space for a mudroom between the dining room and the front door. “Now the family walks in from the garage and places their stuff in cubbies, hangs their jackets on hooks and stows their packs and such under a seat that is also a storage box.” A mirror on the opposite wall of the storage unit provides a last-minute check upon leaving the house. In high-end homes, the mudroom trend is “the bigger the better” with décor including brick or slate floors, wainscoting, fancy millwork and huge crown moldings. It might also include a copper sink for a gardener to cut flowers or a built-in cabinet for the water cooler “so it’s not a big, ugly eyesore” in the kitchen. Where there is no space for a separate room, homeowners are installing cubbies or secret doors for storage under the stairs, she said. At Fair Hills, an upcoming 22-home community of English Country or Gambrel-style homes in Bridgehampton, Zachary Vichinsky of the Corcoran Group, the listing broker, said the $3.495 million to $4 million homes will have mudrooms accessed from the garage or kitchen that are outfitted with stone floors, benches and individual storage areas for clothes, shoes and jackets. “It’s a room of substance,” Mr. Vichinsky said. “It’s something that people want.” An additional “sports barn” area for bicycles and other sports equipment will be near the garage.